Warriors In Action: the generous birthday girl – Nina, the Von Gierke’s warrior! I enjoyed the summer. I spent most of it in the hospital, I had a few emergencies and the heat made more difficult controlling my level of glucose in blood. However, those few days in which I really had holidays were so good that I would not hesitate to go through the bad moments again as long as that allows me to see the sea, the beach, the mountains, the sunset… as long as I am alive! There are still a few weeks ahead for autumn to start but I am already wondering how it will be: the season in which I was born. Last year it was fine, it was probably the season in which I spent less time in the hospital. Since I was very little and my mum was breastfeeding me “upon demand”, that food was enough to keep relatively stable my levels of glucose. In any case, this autumn is going to be special… I will meet Doctor Weinstein! The same week of my birthday (which is my mum and dad’s birthday week as well), if I am not sick, we will all go to a GSD International Conference in Spain. It is a great birthday present! Meeting the person that may develop the GSD gene therapy which would improve so much my life… Can you imagine anything better than that? 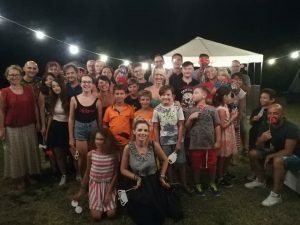 Since we are talking about birthdays, I would like to tell you about another Warrior In Action’s mission, a German Warrior based in Italy: Nadine, someone very special to my Mum. They met at University, where my mum’s hoarse voice called Nadine´s attention. So yes, my mum has a hoarse voice, as my Italian grandma does so let’s see what happens with mine. For now I only say MUMUMUMUMUMUM PAPAPAPAPAPA and BRRRR BRRRRR BRRRR so it is not yet clear how the tone of my voice is. Anyway, back to the story, Nadine has recently become 40 years old. 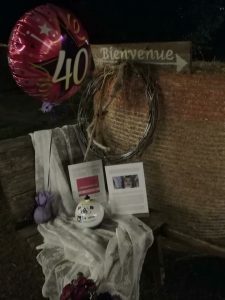 It seems that becoming 40 is a very special thing for adults. I still do not know if I will reach my 40’s… I will have to ask Dr. Weinstein when I see him. Honestly, if all my years of life are as intense as this first one… 40 years seems a long way to go. In any case, I think I will make it and reach my 40’s… I remember that when we got the diagnose my parents were very worried about my life expectancy. However, we have heard about cases of female GSD 1b patients who are over their 30’s and who had kids without GSD… and if the gene therapy works, even if it takes 10 more years, my life expectancy will improve a lot. Eish! Mamma mia! One more time I lost track of my thoughts… Did you know that GSD can cause an attention deficit disorder? May that be the reason why I jump from one story to another? I do not think so, haha, my Mum and aunty Yeyes always do the same and they do not have GSD… but I still think they are both as nutty as a fruitcake! 🙂 … and they also have a huge heart. Well, let’s focus, Nadine, my Mum’s great friend, became 40 and for such a special day, when everybody was asking what she wanted as a present, she replied “I want research” “I want you to donate and support Nina’s cause”. She organized a party in an alternative educational center and they raised funds for GSD 1b research. Life has offered both Nadine and Gualtiero (her husband) many beautiful things: a good marriage, wonderful kids, a healthy family, plenty of love… and the capacity to appreciate how lucky they are to have all that. They do not need anything else. So… what is it that you want as a birthday present Warriors?